First off, I'd like to thank Dubi Silverstein for giving me the chance to contribute to the "Rangers Roundtable" in what is known as the bible of New York Rangers Hockey - The Blueshirt Bulletin. It is the most informative source of the New York Rangers and their happenings that you'll ever find! Thank you very much Dubi, hopefully we'll meet at a game next year and the first one's on me! Getting back to the Rangers, with their first pick the Rangers snapped up defenseman Michael Del Zotto, who by all accounts was ranked to go higher in the draft (was ranked in the top ten a year ago). I think it's a great pick. He's a puck mover, got lots of offensive potential, and he loves to hit (exactly what the Rangers need). Glen Sather and his staff did a little wheeling and dealing to pick up and extra draft pick in this years draft as well. Overall it was pretty much a balanced draft with 3 defensemen (Del Zotto - 20th overall, Tomas Kundratek - 90th overall, and Mitch Gaulton - 171st overall) and 4 Forwards (Derek Stepan - 51st overall, Evgeny Grachen - 75th overall, Dale Weise - 111th overall, and Chris Doyle -141st overall). Hopefully we won't have to wait long for Del Zotto to crack into the bigs. Other Rangers News: Jagr, Jagr, Jagr. What's going to happen? Who really knows, but I feel the same today as I did at the end of the season. It comes down to these factors; Money, Terms of the contract, and Desire to stay in New York. I said it all along, if you lose Jagr (even though he underachieved last year) - who is going to step up to the plate? Jagr still commands respect when he has the puck and as a former defenseman who played against the likes of Gretzky, Lemieux, Etc. - Jagr has that intangible of keeping the opposition's defense scared to death when he comes barreling down on them. It's a tough call for both sides. Now, if that isn't enough, I hear the Rangers are interested in maybe acquiring Mats Sundin? Please! I know he's a future Hall of Famer and there is still plenty of gas in the tank... but at what cost - salary wise? He's not going to come cheap, that's for sure. Also, he's older than Jagr (37 years old). Finally, I'm here to again continue with the "Sean Avery must re-sign with the Rangers" ordeal. I'm all for it, but he has to re-sign at a reasonable price. I'm hoping it will work out for both sides (He needs NY & NY needs him). There is a lot of baggage with Avery, but one thing I keep in my mind is his record with the Rangers when in the line-up (50-20-10) and without him in the line-up (9-13-3). That's hard to argue with! I hope things work out and fall into place for the Rangers. They are not too far off in building a Stanley Cup Champion. 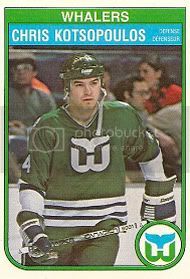 A couple of weeks ago I mentioned that the Chicago Wolves coach, John Anderson, had done what he could in his coaching carreer and that it was time for a shot in the NHL. 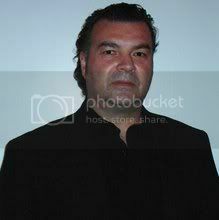 Well, he got that shot with the Atlanta Thrashers and I congratulate John for his hiring and I wish him well (He deserved it)! 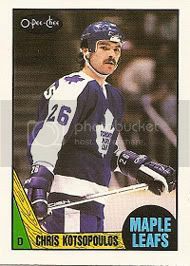 Oh, and one last thing - Barry Melrose is back in the NHL. What was the world's worse secret, they finally announced Barry as the head coach of the Tampa Bay Lightning. It's a great choice, in my opinion. Barry was my last coach and I remember how well organized he was and was able to get players to play hard. I was on my way out and played very little, but my observations were nothing but positive about Barry. Good luck & it's about time! Over and out for now, please check back next week and don't be afraid to leave some feedback! 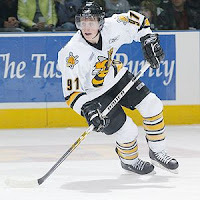 With the NHL Draft just a few days away, it's fairly obvious who's going to be the #1 pick (Stamkos). After that, it's anyone's guess how the draft will go. The New York Rangers are slotted at #20 and here's to selecting a player who helps and helps the Rangers sooner rather than later. I must admit I'm not that knowledgeable with the kids coming from Junior, High-School, College, or even the European Leagues. It's too much to digest for me. The draft does have some exciting happenings year after year - like trades, players dropping, and players rising. I do know that all the science involved today (fitness, psychology, Etc.) gets a little crazy but it's the way of the world of sports, not just Hockey alone. Getting overly scientific sometimes works and sometimes it backfires. Either you can play at a high level (NHL) or you can't! It does not take long in hockey for the teams to figure out once you're drafted whether or not you've got it or you don't! There is no 5 year waiting period, it's more like 2 and done. 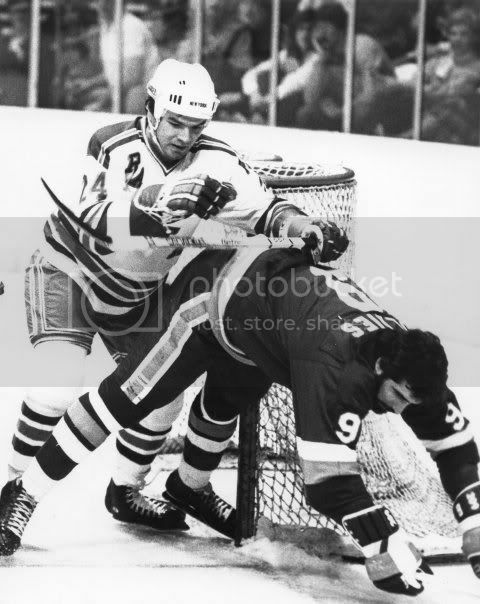 Anyways, I'd like to congratulate Glenn Anderson on his induction into the Hockey Hall of Fame. He is totally deserving of this honor. 6 Stanley Cups, pretty good career stats, but what I think what really stands out is playoff numbers, they are incredible! Those numbers rank 4th all-time behind... let's see if these names ring any bells. Wayne Gretzky, Mark Messier, Jari Kurri, that's pretty nice company! Oh, and just to throw this in... Paul Coffey is 5th. Like I said, Congrats Glenn! Oh and one last thing. What's this I hear about the NHL threatening to terminate ownership of my beloved Rangers? All this over a website/lawsuit? Nice move on your part NHL... it doesn't matter who's right or wrong. You have enough problems convincing most of America that hockey is a great sport. So what do you do? You publicly go after the team with the biggest market and some of your most tried and true die hard fans. I believe this matter should of have been solved behind closed doors. 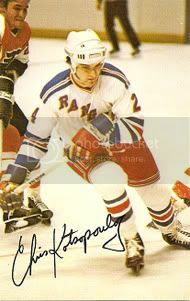 Yes, I am a former NHL player and once was a Ranger (and now am a Ranger fan), but does it make sense to do battle with the New York Rangers and MSG? Your biggest and best fan base in America? I think not. I can only hope this matter is resolved in a quick and clean fashion... or once again the NHL has blundered. Over and out for now! Keep checking back because as an old player once said, "You just never know". It's been one week since my last post and I'm already feeling the ho-hum days of no hockey. We know the Red Wings won, but now it's time to take a look at other teams off-season moves. My beloved New York Rangers have their hands full. Sign Jagr? Don't sign Jagr? Avery's about to be a free agent. Rozsival just had surgery on his hip... re-sign him or let him go? Do they add to the team through free agency (Brooks Orpik sounds good to me)? A lot to digest and I believe Glen Sather will make the right calls when it gets down to the nitty gritty. The Rangers are not in a rebuilding stage, like many seem to believe, unlike other teams (Sorry Toronto). Just a few pieces of the larger puzzle need to be in place (Draft, FA, re-signing their own). I think things will work out and the Rangers will be a contender for the Stanley Cup next season! Congratulations is in order for the Chicago Wolves who captured the Calder Cup with a 4-2 series win over the Wilkes-Barre Scranton Penguins (Penguins and Baby Pens come up short in 2nd place, ouch... That's gotta hurt) - especially to coach John Anderson who's now won 2 Calder Cups and 2 Turner Cup Championships. Great job John! I wonder why a guy like this doesn't get an NHL head coaching job instead of re-treads that seem to be recycled yearly... ridiculous! 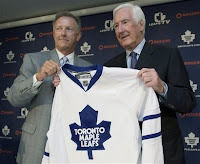 I see that my hometown Toronto Maple Leafs have hired a new coach in former San Jose Sharks coach Ron Wilson. Good luck Ron! You're gonna need it! You're also gonna need thick skin. The people and the city of Toronto are totally engaged with their beloved Leafs. 24/7/365; TV, Radio, Newspapers, at work - the Leafs are the only thing that matters! Like I said, good luck! I will probably reduce my posting over the hockey off-season to about a post a week, just to let the readers know what's going on. Over and out! The Detroit Red Wings captured their 11th Stanley Cup with a 3-2 victory in Game 6. Led by Conn Smythe Trophy winner Henrik Zetterberg, the 'Wings once again showed that "The Machine" just doesn't care where they play! Nashville, Dallas, or Pittsburgh on the road... Game 6? No problem. This team is built perfectly for post-lockout hockey. They are quicker, faster, and just too disciplined to deal with. The Red Wings basically take your offense away and put you in a straight-jacket-like blanket. You have no room to maneuver, pass, or let alone think you're possibly going to create shots! In the end, they deserve the Cup. They are the best and I really don't think any team can deal with them at this moment! Congratulations to the Red Wing players and franchise. As for the Penguins, I really was surprised how a team that rolled through the Eastern Conference Playoffs with such ease, could look so inept against the Red Wings. You have to admit, no one would of guessed that the Pens would have been shut down they way Detroit did! I mean, really, 9 goals in 6 games? Who in their right mind would of predicted that! Maybe the young Pens cracked under the pressure. This is Lord Stanley's Cup afterall. Maybe Detroit was the real reason behind Pittsburgh's play in this series. I know now that Detroit is a "Super Machine", but I think Pittsburgh definitely felt the heat and did not perform as well as they could have (and did in the Eastern Conference Playoffs). All in all, the Penguins had a great season, it just came up a bit short against a better team. When Peter Sykora scored at 9:57 of the 3rd OT on a power-play, a goal he actually predicted that he would score, the Pittsburgh Penguins have at the very least forced a game 6 Wednesday night in Pittsburgh. A double minor for high sticking provided the Pens with a glorious opportunity and they capitalized with Sykora's high wrist shot that beat Chris Osgood on the short side. The Penguins had 2 heroes tonight: One was Maxime Talbot, who's "never say die" attitude provided the Pens with the tying goal with only 35 seconds remaining. It was a huge shock to the Detroit Faithful, who are the time were singing about winning the cup (a little early, don't you think?). The other, of course, was Marc Andre Fleury. He was in a word: Fantastic. The Penguins had a 2-0 lead early on thanks to goals by Marian Hossa and a fluke goal by Adam Hall (Hey, they don't draw pictures on the score sheet!). Detroit answered in the 2nd period on a goal by Darren Helm to make the game 2-1 going into the 3rd period. In the 3rd I had this eerie feeling that Pittsburgh needed to score that important next goal, but it didn't happen and Detroit pressed on. Tyler Kennedy's penalty gave Detroit the chance they needed, and a deflected shot from Zetterberg by Pavel Datsyuk tied the game at 2 (more on the penalty call later). A few minutes after that, Brian Rafalski appeared to have clinched the cup for Detroit with a seeing-eye wrister that beat Fleury on the left side. That looked like it was the final dagger, Pittsburgh looked dead and it was a "done deal". If not for Maxime Talbot's energy, game tying goal, and Fleury's play in net - it would have been all over for the Pens. Hockey is a great game, sometimes strange. How else do you explain being outplayed, outshot, outhit, and basically outeverythinged and still manage to win? - Ryan Malone took on a slap shot to the already broken nose he suffered earlier in the series. He was back on the bench as fast as he could be, of course. That's what I call a true hockey player! 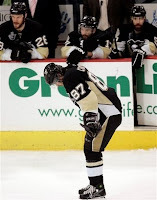 - Malkin was once again a mess on the ice. They are gonna need him and he better snap out of this funk! And please stop making excuses for him... he's "tired", are you kidding me? - The NHL is really getting exposed with their post-lockout rule changes. No consistency in the calls (I wish they would have just left the game the way it was, let the players play - as I've said many times before!). The penalties called on both teams were terrible (Tyler Kennedy's hooking call was garbage). Detroit players crashing the net - I agree with Mike Milbury and Co., what are the players supposed to do? Sorry NHL, you goofed and you know it.